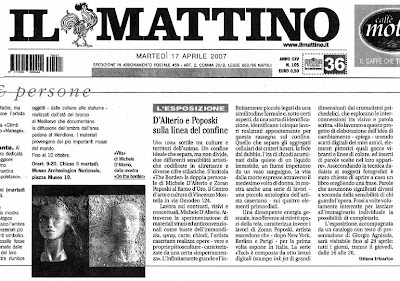 Zoran Poposki artBlog: Review in the newspaper "Il Mattino"
A thin line between cultures and expanses of the soul. An ideal boundary that separates, but does not divide, two different artistic sensibilities codified in two very different stylistic codes. Entitled “Border”, the joint exhibition of Michele D'Alterio and Zoran Poposki takes place at Ramo d’Oro, the Art and Culture Center of Vincenzo Montella at via Omodeo 124. (…) An explosive gestural energy, which wants to break out of the confines of the canvas, characterizes the works of Zoran Poposki, a Macedonian artists who, after New York, Berlin, and Paris, is making his debut exhibition in Italy. The series “Hush” comprises eight digital works (large-scale inkjet prints) of psychodelic chromatisms, which explore the interconnection between the visible and the written word. “In this project I am elaborating the idea of change – he explains – by combining digital photographs of my friends, pictorial elements, such as vibrant drops and lines of color, and inserted selected words." Utilizing a Dadaist technique, the photographed subjects were requested to randomly open a book and choose the first sentence they see. Words that acquire different meanings depending of the sensibility of the spectator. Sentences sometimes intentionally left unfinished to leave room for individual imagination to complete them.